It's worth pointing out that the feature has also been renamed from Full importance settings to Power notification controls. It is still found under System UI Tuner in the Settings, in the Other section. 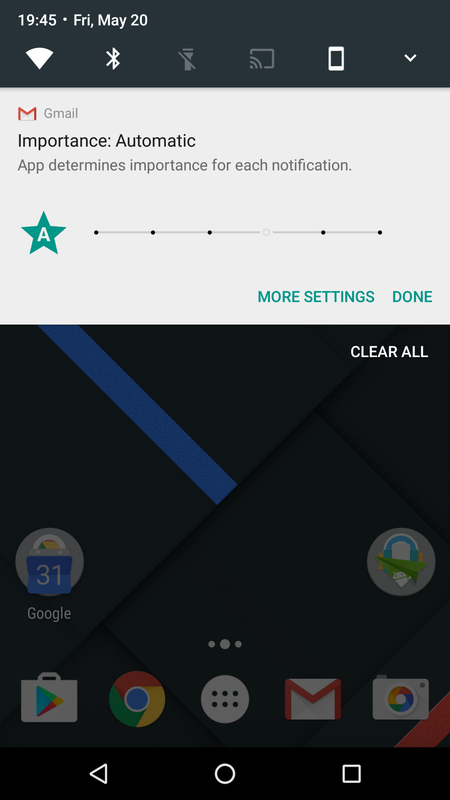 When enabled, you can tap and hold on any notification to change the app's priority level. 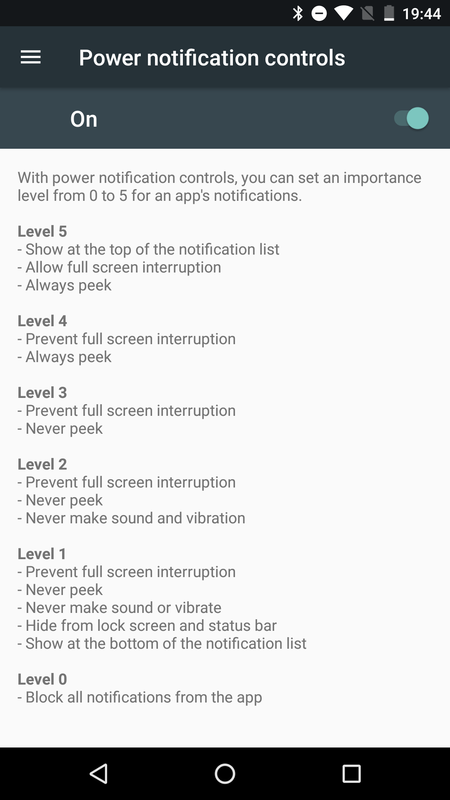 Automatic is actually an "A" star toggle next to the 6 level picker, and by choosing it for any of your apps, it's the app itself that will determine on a per-notification basis whether to make a sound or not, peek or not, and go to the top of the list or stay in its normal order. We're not sure how app developers can code that into their apps or if they even have that option now (it might be coming later), but the possibilities are exciting for the future. As an example, eBay could give an urgent importance level when a watched item is ending in 15 minutes or when you're outbid, but a low importance level to a shipment notice or new message from a seller. Gmail could assign a high level to emails marked as priority and low levels to some secondary labels. And so on. 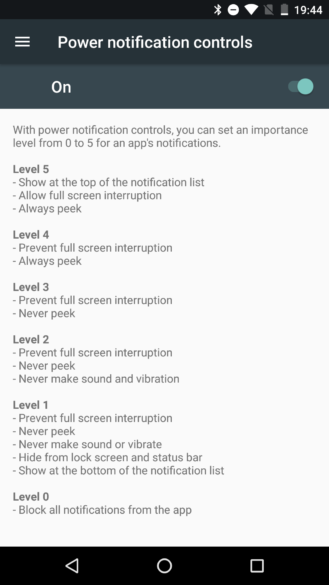 The potential is huge, and I wouldn't be surprised to see Google first let developers categorize different types of notifications from their apps, then even use some algorithms and learning to automatically assign a priority to every notification without any developer intervention. But let's not get ahead of ourselves. For now, by its mere location, it's clear this is still pretty much an experimental feature. Not a lot of people know how to enable the UI Tuner in the first place, so this is a big work in progress and it's just a more granular control available only for those who know enough to get to it. Given the number of changes this feature keeps seeing with each N developer preview release, it's also obvious that this is far from finished and Google is pretty invested in trying different ideas to see how they work. As many of you pointed it out, it looks like the automatic feature isn't new, even though the star toggle is actually new in N in full importance / power notification mode. 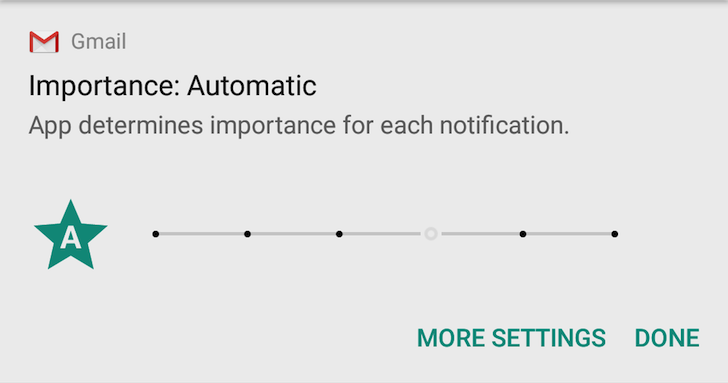 Android already lets developers control priority on a notification-by-notification basis (see "Correctly set and manage notification priority" section here). It's how all notifications work by default. But if you decide to go the full importance route, you get to manually set each app's priority level, which overrides the freedom given to the developer to make the decision. This Auto toggle lets you restore that setting back to its original state, giving the decision back to the developer.